Here's the first section of benchwork and typical of the design that I started with. A word about the benchwork. The benchwork is open grid which I designed to be free-standing, with removable legs and in sections no longer than 7 feet. The sections are bolted together. Why all of this complication? 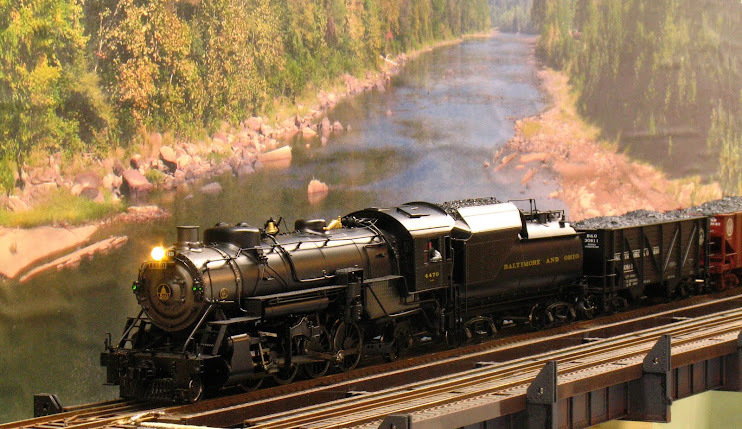 Because in 2006 it was mine and my wife's intent to move to another house that we would custom build; and I intended for my railroad to move with me rather than start from scratch, which in O scale is too expensive. By keeping the sections to less than 7 feet they could fit into a U-Haul or PODS and by being freestanding they could be reassembled into any future basement. The change in the economy in late 2008 and a job change in 2009 will keep me in this house for a while; but I'm still building with a future move in mind. I have since changed my design to use 2x4 legs rather than 2x2 because I could not get straight 2x2 lumber - it would always twist and curl. Premium, straight 2x4s are always available and I have had only 1 go bad on me.